Got an aquaculture facility that’s not operational or not making the amount of money you desire. 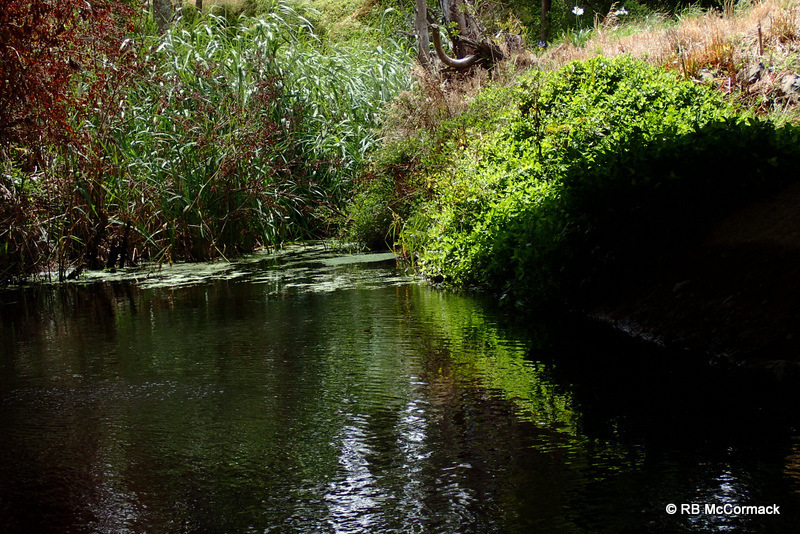 Why not lease your farm or your ponds? We have clients in desperate need of ponds now. 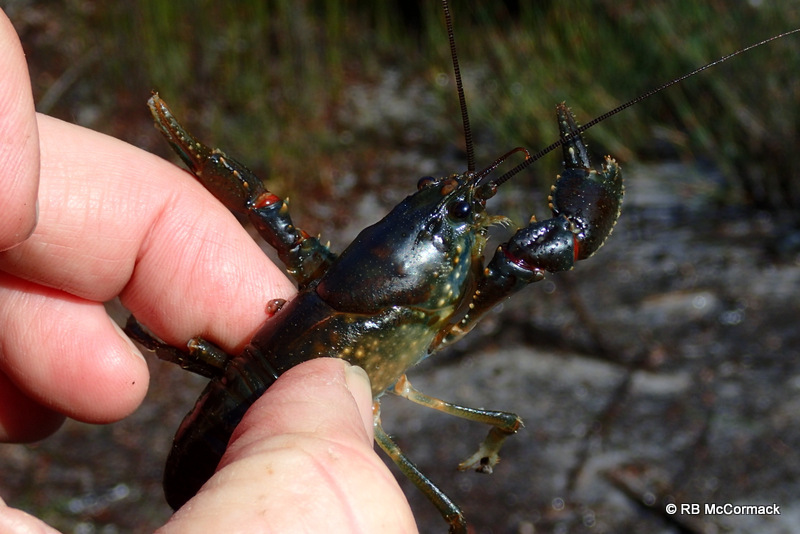 Aquaculture is the fastest growing primary industry in Australia. 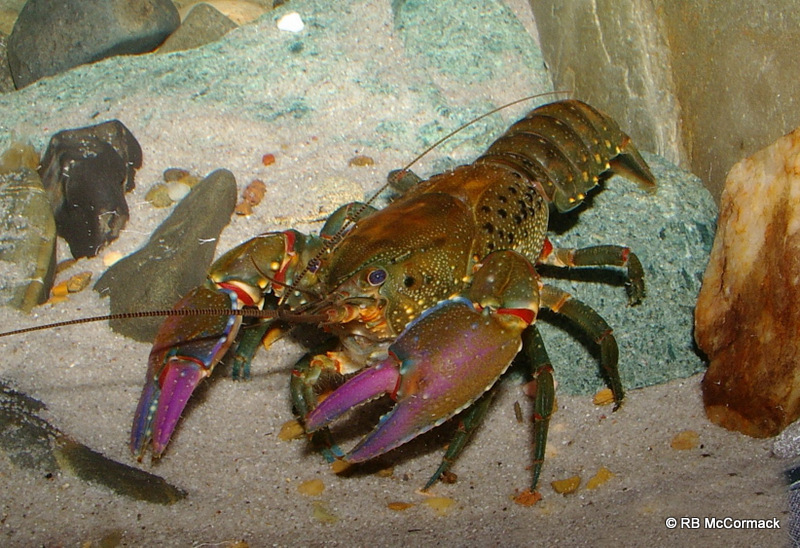 Demand for aquacultured produce is skyrocketing and new production methods are increasingly improving profit margins making modern land based aquaculture an increasingly lucrative enterprise. Unfortunately, difficulties in obtaining approvals for new ponds and the ensuing time delays in receiving approvals and then building ponds makes the interest level in existing ponds extremely high. 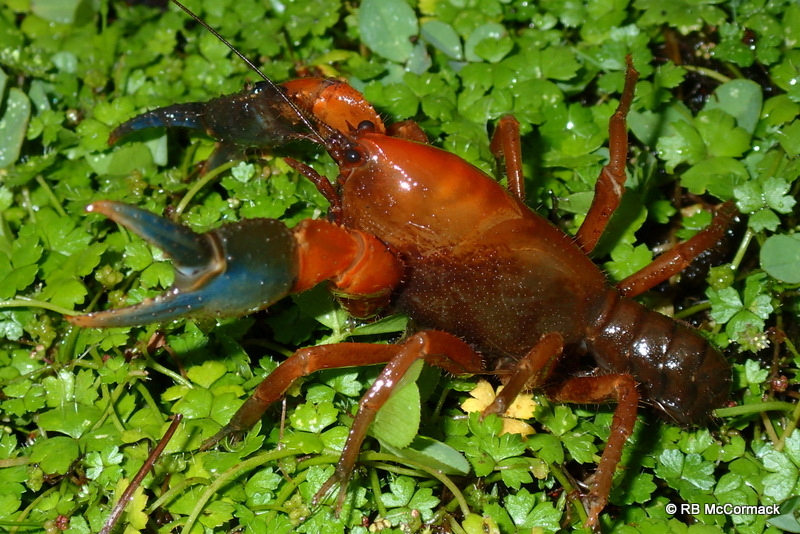 Existing yabby and fish ponds are wanted now so that large scale commercial farmers can expand their production by using your ponds. They come to you, use their staff, their equipment and technology, to get your ponds into commercial production. They don’t need you to do anything at all, you do not need to expend one cent towards the enterprise. 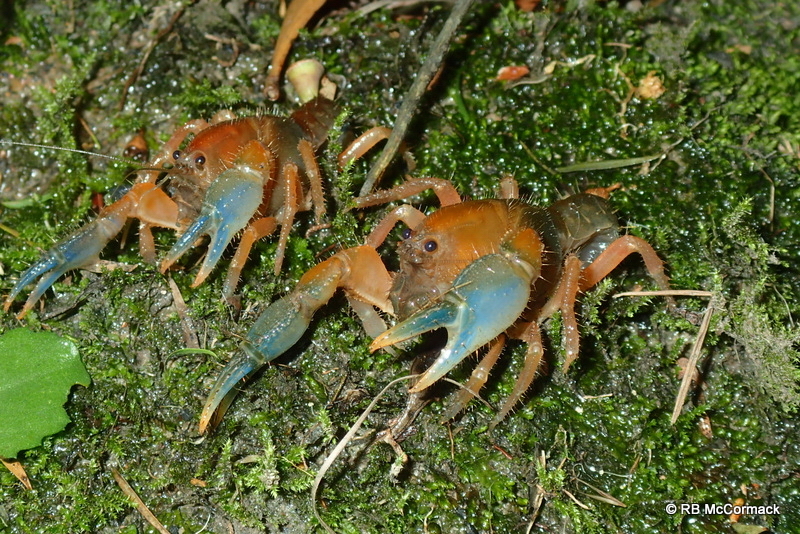 They just rent your ponds or property nothing more. If you have ponds not producing much or haven’t been in production for years then contact us for further details. Perhaps we have a lucrative solution to create a substantial, reliable income without any effort or expense from your end. 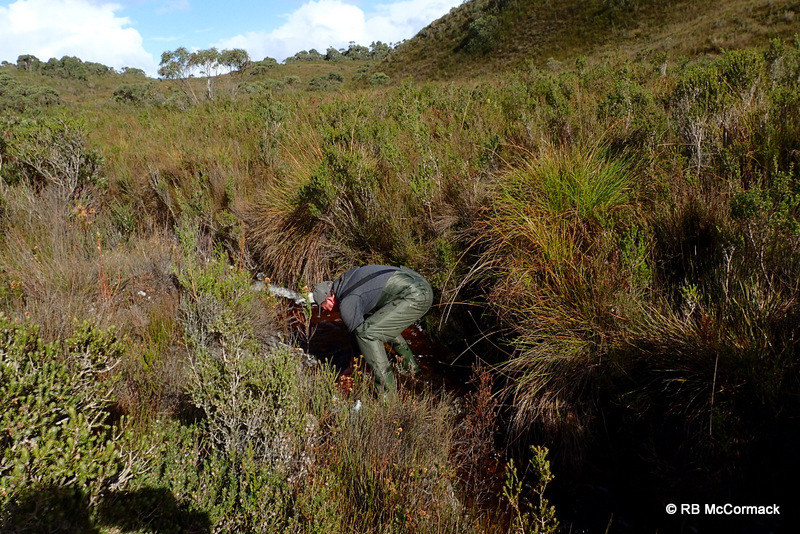 In early May four members of the ACP visited Tasmania. We are also members of the NSW Aquaculture Association and one of the reasons for visiting Tassie was to visit Huon Aquaculture. For an article of Huon see: http://nswaqua.com.au/huon-aquaculture-sea-cages/ Whilst in Tassie we took full advantage of the opportunity and travelled the country from one end to the other. 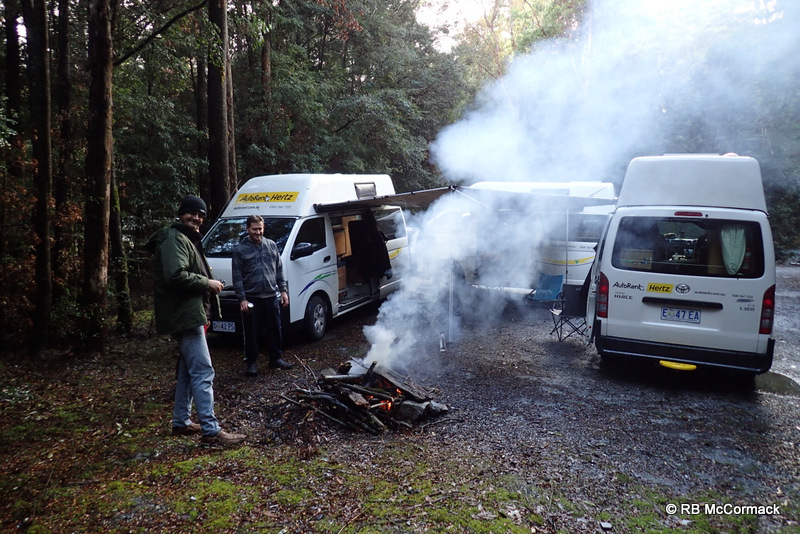 We flew into Launceston and hired 3 campervans, Paul and I had one each and the Burnes brothers shared a van. Despite the constant rain, snow and wind we had a great time in Tasraina. 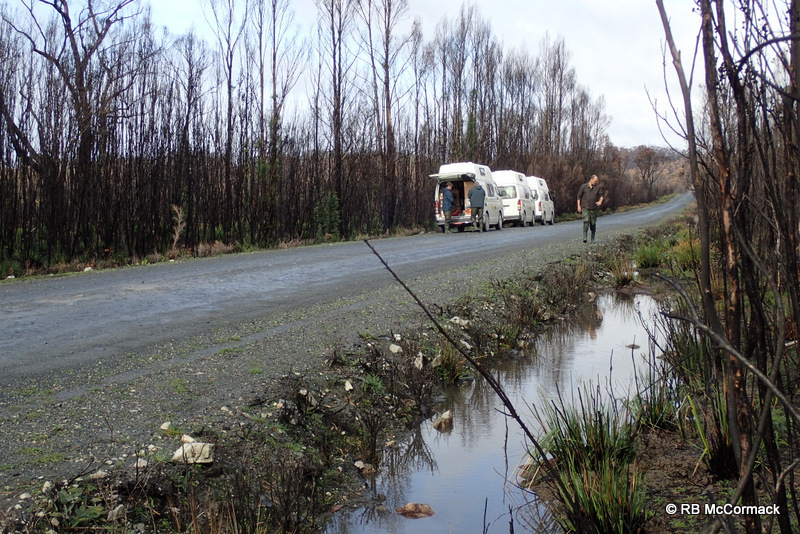 The first night saw us camped at the end of a small track on the Great Forester River. 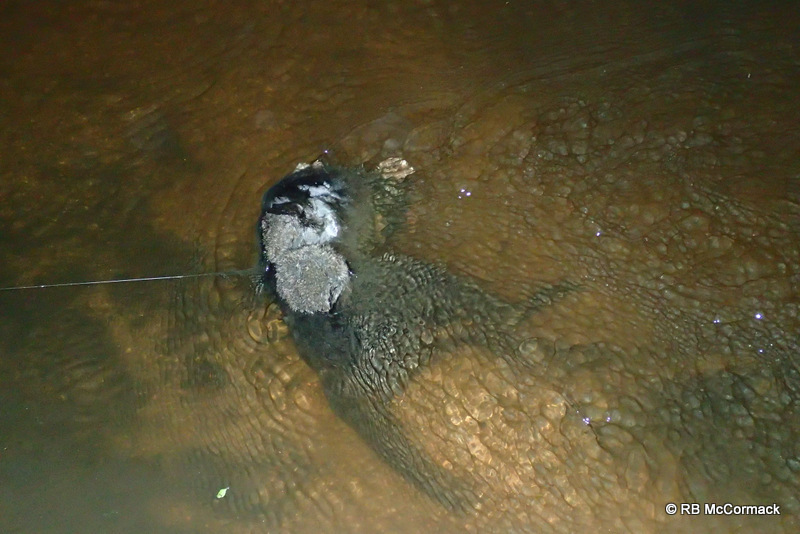 We didn’t have any bait so dragged a bit of road kill (dead wallaby) and tied that up on the edge of the river to see if it attracted anything. 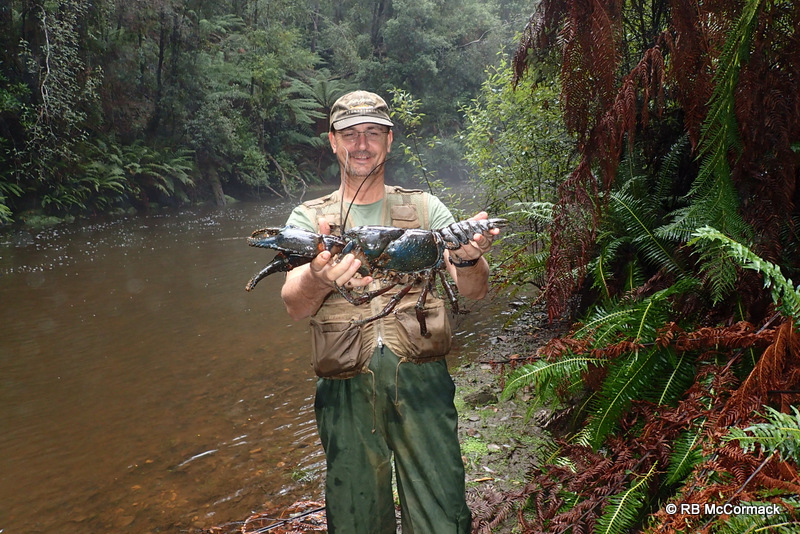 Surprisingly we managed to attract a 1.5 kg giant Tasmanian lobster. It was a bit of a surprise and only quick action by Craig saw it captured by hand. 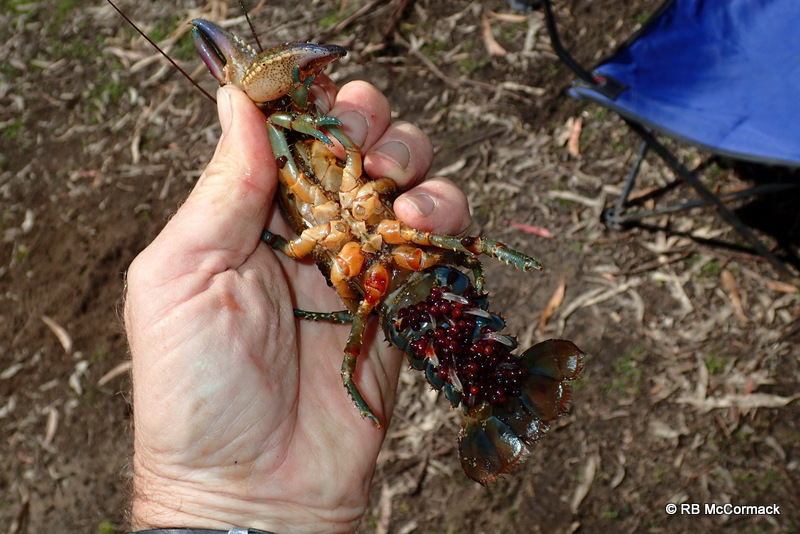 It was a female but not berried even though I would have expected it to be breeding season. After a photo shoot we release here back into the river, but a great start for us. 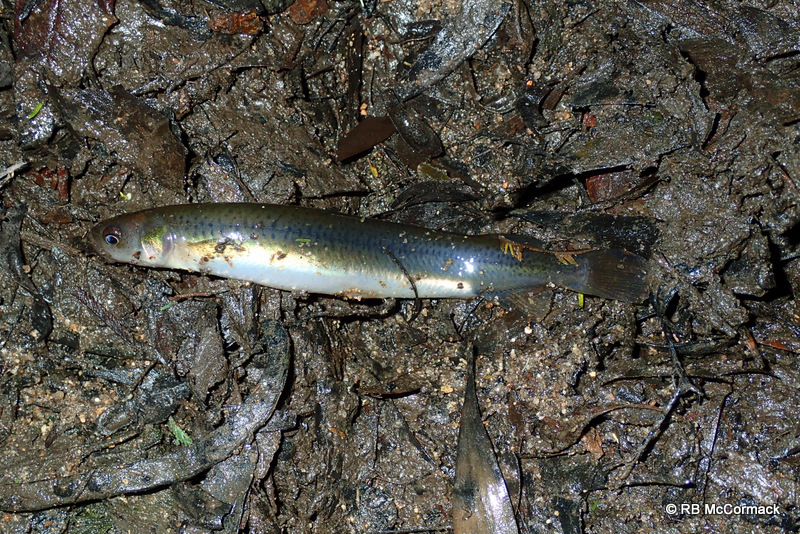 We observed large numbers of eels in the creeks and lots of Galaxias as we spotlighted the creeks and rivers at night. 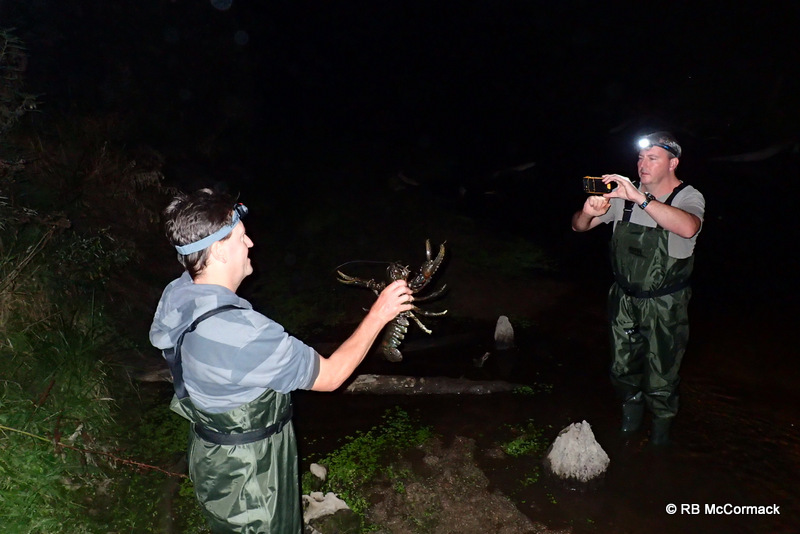 We didn’t have a plan as such we were just driving around checking out the country side and stopping at likely spots to see if we could find a crayfish and have a photo shoot of the catch of the day. 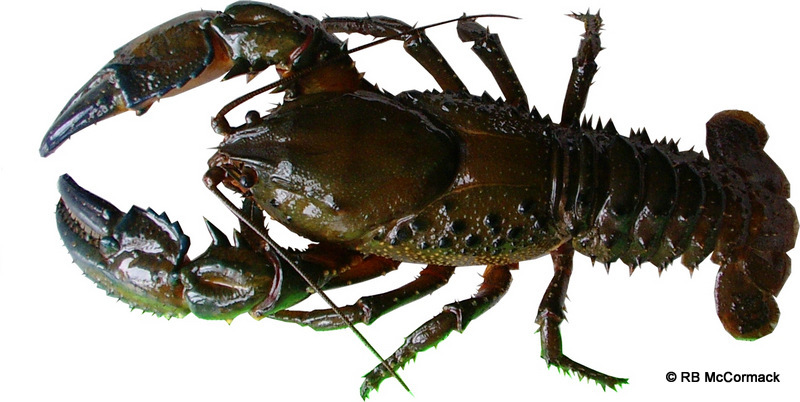 Engaeus crayfish were quite common and the first specimens we found were Engaeus laevis. 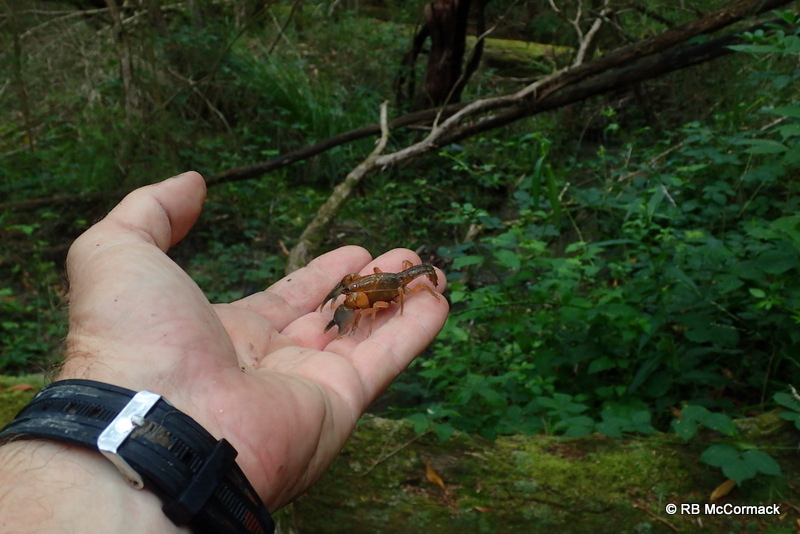 We also found a number of Engaeus fossor. 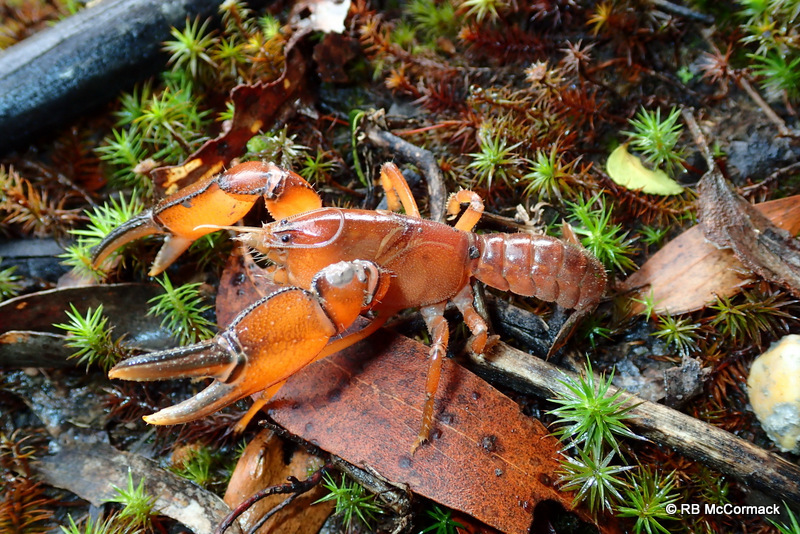 Interestingly we found quite a large colour variation in the species. 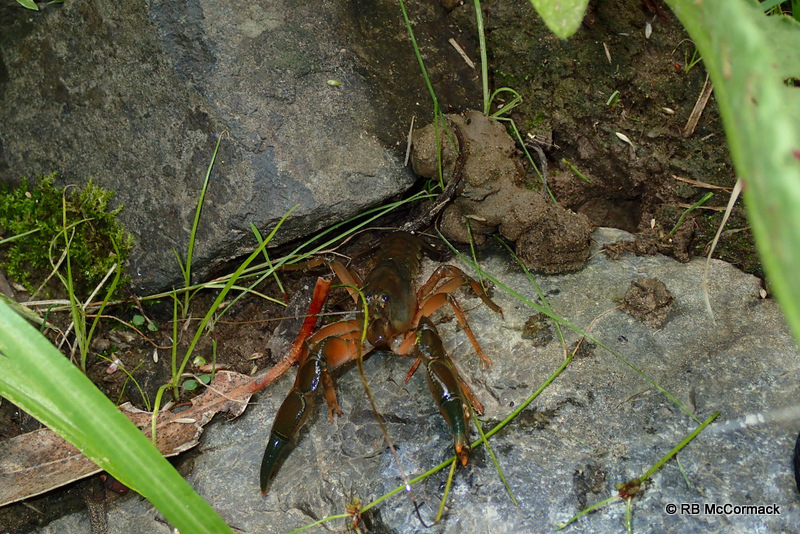 Engaeus crayfish are relatively easy to find, their presence is given away by their chimney shaped burrows. 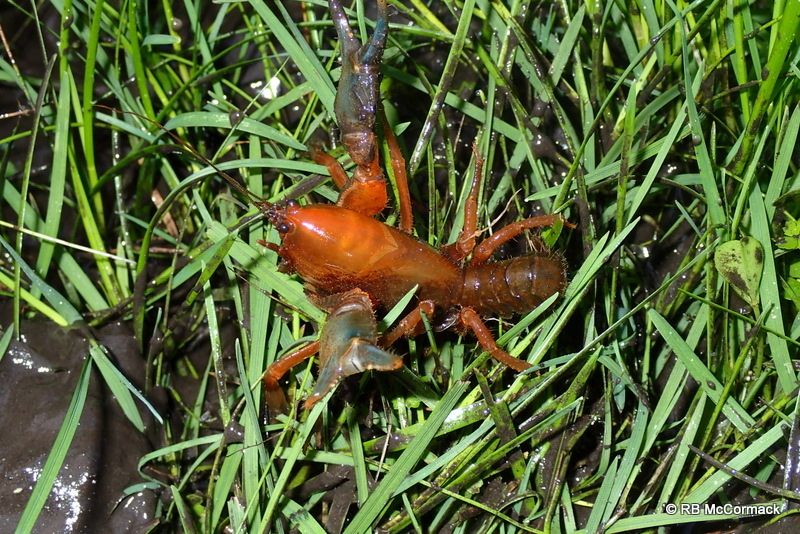 They are a deep burrowing crayfish so knowing where they live and then actually getting a specimen out of the burrow is a very different matter. 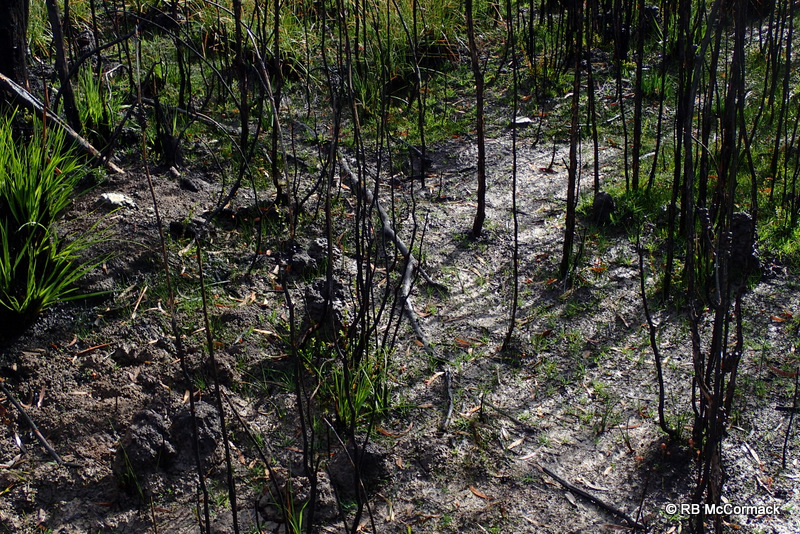 Large parts of Tasmania suffered from bush fires over summer. 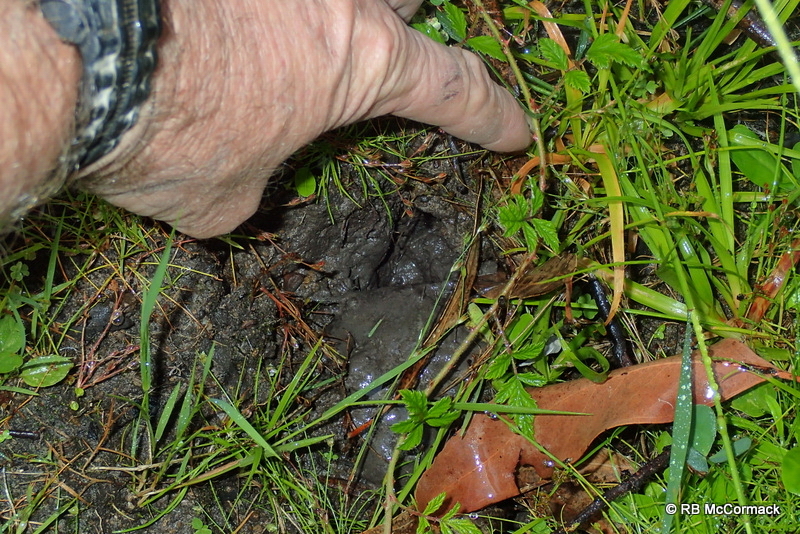 This however made it easier for us to find the burrows. Its always good to find something new. 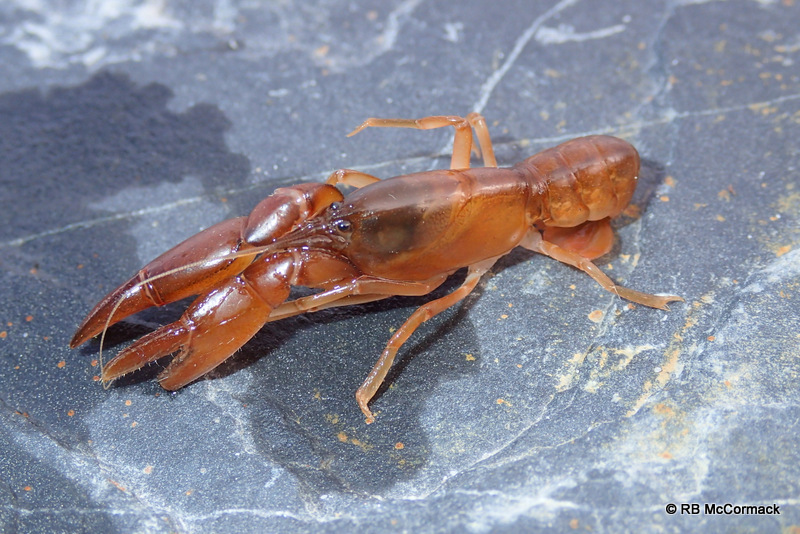 Paul V managed to catch an Engaeus lengana. 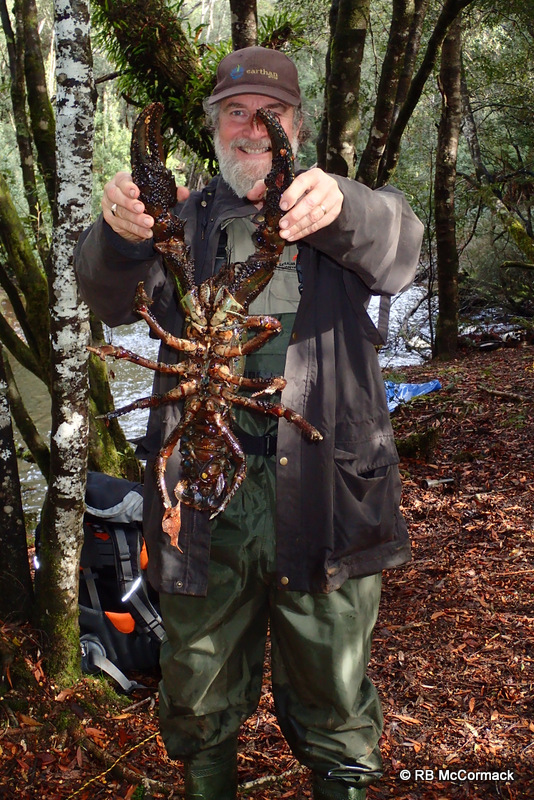 Thats the first time I’ve ever seen one so very happy with that catch. 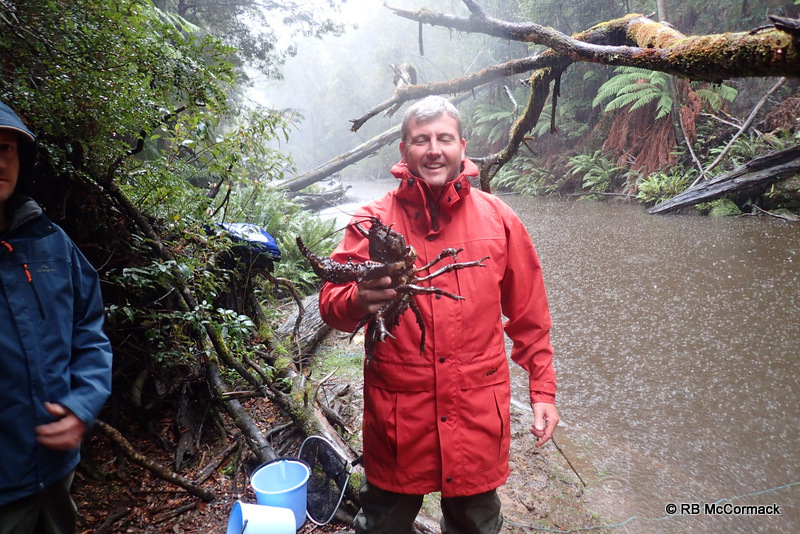 Just being tourists an traveling around the whole state we didnt have much in the way of survey equipment, basically it was all capture of crayfish by hand. 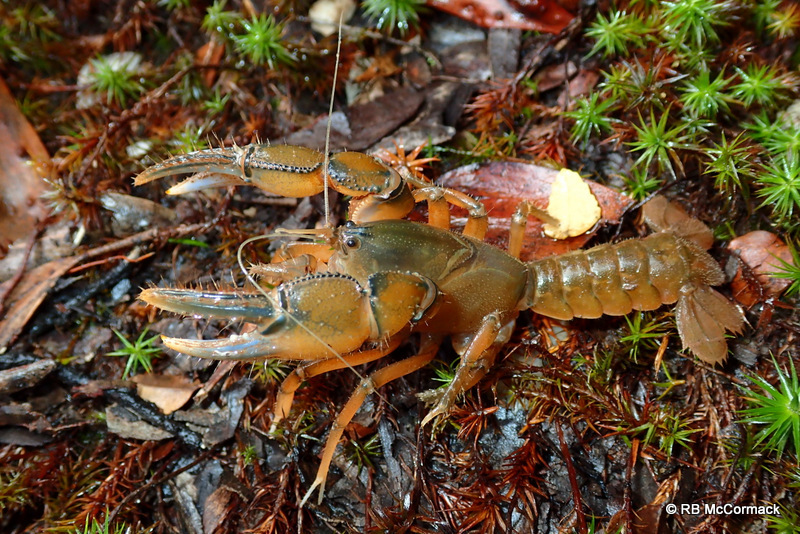 Small creeks in remote areas produced a surprising number of crayfish species. 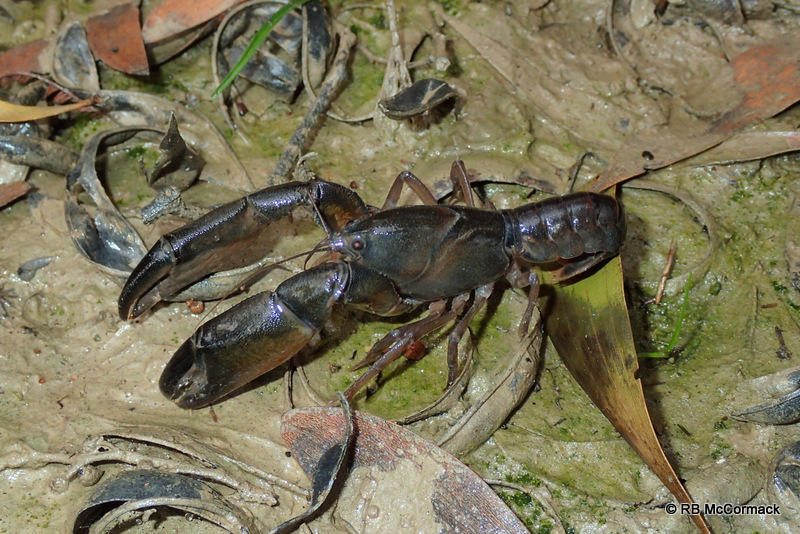 This creek was full for Astacopsis tricornis. Unfortunately, the weather was less than cooperative with high winds and rain. The state was in drought till we got there. Once we arrived the heavens opened. 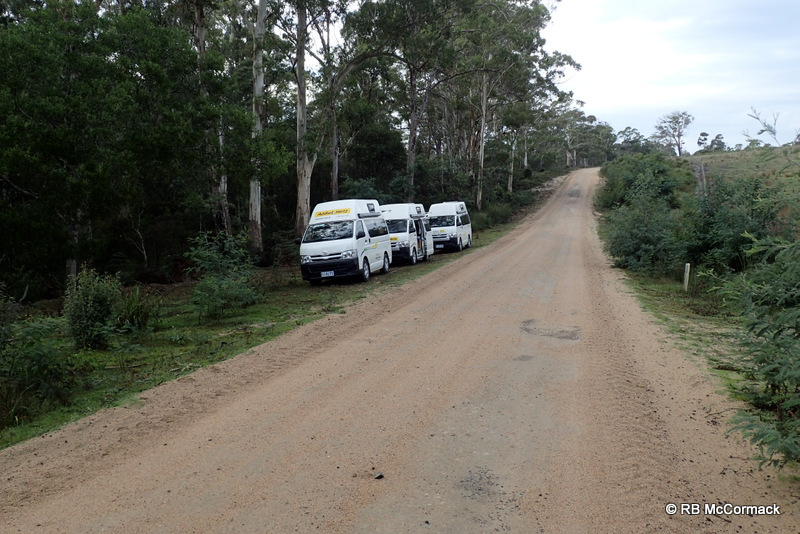 Nearly all our travels through Tassie were on the back roads. Unfortunately, with the high winds and rain, trees down were a huge problem for us. The boys managed to clear this fallen tree with the saw on a pen knife. 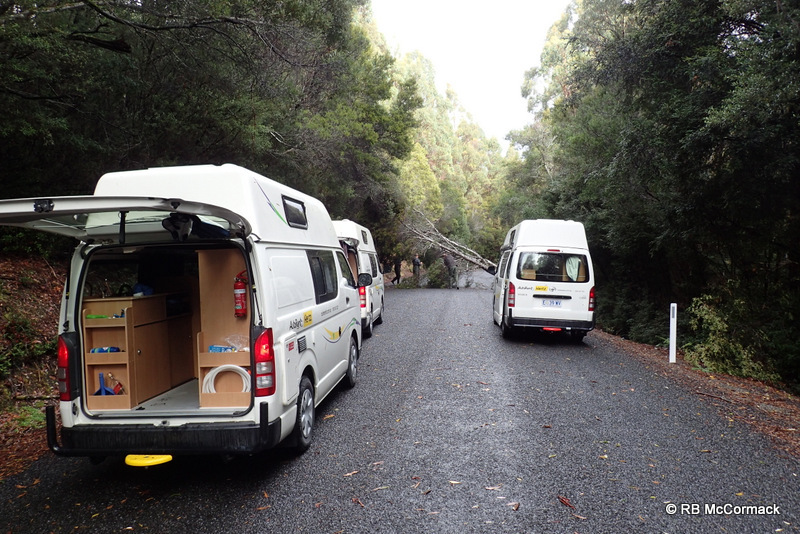 We managed to get another 2 km up the road before we were stopped by huge fallen trees that completely blocked the road. 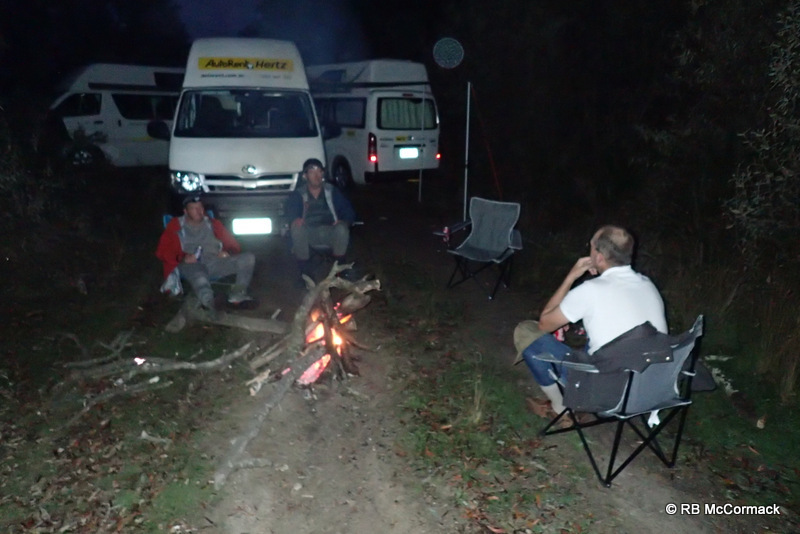 We were fully self sufficient so we would make camp, survey the area around the camp and await rescue by someone with a big chainsaw. I had a fantastic time in Tassie with a great bunch of mates. We were cold an wet most of the time, spent long hours going short distances, spent hours digging holes, trudged up and down mountains, had to abandon camp in the middle of the night just before the floodwaters washed us away, cleared fallen trees off the road with a penknife, and spent endless hours at the end of the trip cleaning the mud out of our campervans, but despite all that- I wouldn’t have missed for the world.